When first exploring the option of buying a diamond, consumers often want to know what the differences are between clarity enhanced diamonds and non-enhanced diamonds. This article compares the features and benefits of each type. When diamonds are mined, literally tons of earth is sifted through to find "gem quality" diamonds. Only 1.6% of all diamonds mined are rated this way. The balance of diamonds mined are industrial grade and used for commercial purposes. After sorting, the gem quality diamonds are packaged and sold to diamond cutters. The origin of both clarity enhanced diamonds and non-enhanced diamonds start their journey in the same batch. See Figure 1. Figure 1. The origin and journey of gem quality and industrial diamonds prior to cutting and polishing. Gem quality rough is sent to diamond cutters. Once cutters receive their parcels of gem-quality diamond rough, it is fashioned into a shape and cut that will produce the most economically feasible diamond possible. It is only after cutting, that one can determine if a diamond's beauty and value can be increased through an enhancement process. See Figure 2. Figure 2. 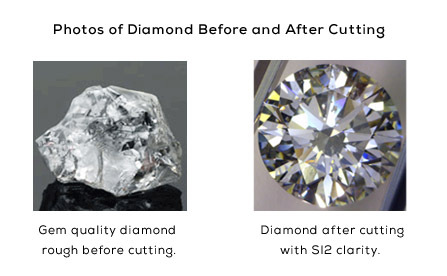 Photos of a diamond before and after cutting. Note the difference in shape and the inclusions visible in the diamond after cut and polish. Most diamonds are sold with their original Nature formed inclusions. Naturally occurring flaws (inclusions) are expected in diamonds, and it's very rare to discover a diamond that is considered flawless under 10X. Non-enhanced diamonds go to the retail market, and are priced on their unique characteristics including clarity, cut, color, and carat weight. There are rare times when a diamond will form a surface inclusion. How? Only a diamond can cut another diamond. This is done on a wheel that is very slippery. Even a slight, off-movement can cause the cutter to slip and create a tiny, white, feather inclusion on the surface of the gem-quality diamond. These types of inclusions are candidates for clarity enhancement. To correct these feathers, a diamond-like substance is used to fill the flaw and restore the diamond to its maximum beauty. The process is analogous to a windshield repair. The inclusion is removed and the clarity becomes better than it was previously. Another type of clarity enhancement involved laser drilling. This process can be applied when diamonds have nature-formed black piques or show black reflection. Many of these inclusions can be seen by the unaided eye. A microscopic laser drill is used to remove such inclusions. Then Voila! The diamond is restored to show its maximum sparkle and beauty. How does clarity enhancement affect the brilliance and sparkle of a natural diamond? Clarity enhancement increases the brilliance and sparkle of an included (flawed) diamond. Surface inclusions in a natural diamond are usually relatively minor and will disrupt the amount of light the diamond reflects—therefore reducing sparkle. With today's technology, inclusions like this can become invisible. Typically existing on the outer-most layer of the diamond, surface inclusions are essentially "sealed" during the enhancement process. The diamond then becomes more stable than a non-enhanced diamond with similar inclusions. And yes, the clarity enhanced diamond is still real and can be worn just like a non-enhanced diamond. Figure 3. 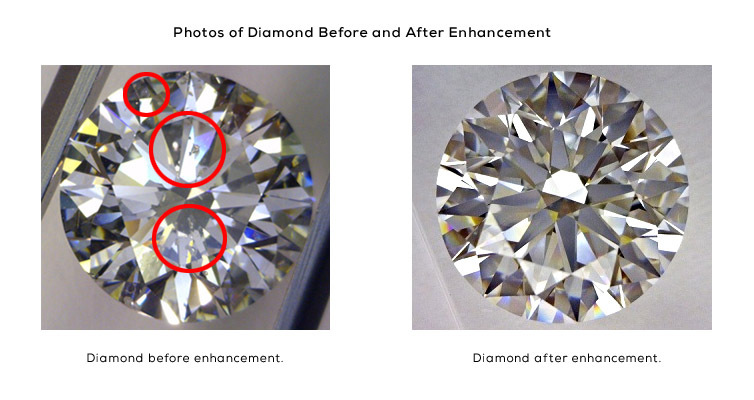 Photos of a diamond before and after enhancement. Note the improved light refraction in the diamond and the improved, flawless appearing clarity. So, if clarity enhanced diamonds are real, why are they so inexpensive when compared to ones that are non-enhanced? The answer to this is simple. Clarity enhanced diamonds start off with a lower clarity than their non-enhanced counterparts. In this stage, the diamonds lack the necessary clarity to cost more. The initial investment to the trade is substantially less other gem quality stones. After enhancement, the differences are indistinguishable. See Figure 3. Side-by-side, an enhanced diamond will appear the same as a non-enhanced diamond. They do not, however, compare in cost. See Chart 1. What is the value and appreciation difference between clarity enhanced and non-enhanced? What is right for me? Should I buy a clarity enhanced diamond or a non-enhanced diamond? Clarity enhanced diamonds have been on the market for nearly 3 decades. Over the years, most jewelers accumulated inventory of non-enhanced diamonds at higher prices. Because many jewelers have a bias to sell their own non-enhanced diamonds that yield higher profits, some may not divulge this to the customer. It is always wise to consider the motives of your advisor with diamonds, as it is with any important purchase. Choosing a diamond dealer who carries all types of diamonds, including clarity enhanced, GIA certified HPHT diamonds, and other GIA certified diamonds may be your best option. They will offer personalized advice based on your needs and budget—not just offer you a diamond that they prefer to sell. Some have plans to budget for larger expenses in the near future: A home, furnishings, honeymoon, a family, an automobile, etc. We call this "rational thrift." In summary, clarity enhanced diamonds have the same origin as a non-enhanced diamond. The clarity is simply improved after cutting with an enhancement process that allows more light to shine through the diamond. Thus, creating more fire and sparkle than it had in its previous state. The enhancements are very small and not visible to the human eye. The enhancement process makes the diamond no less real or natural than any other diamond. Compared to non-enhanced diamonds, enhanced diamonds offer a larger carat weight at a lower price. As clarity enhanced diamonds are still real and natural, history shows clarity enhanced diamonds have a larger percentage increase than their sister diamonds. To help determine if a clarity enhanced or non-enhanced diamond is for you, we invite you to contact us for a pressure-free consultation. Hadar Diamonds also offers an in-home preview of a diamond at no charge or obligation to purchase. For more information, visit www.hadardiamonds.com or call Hadar Diamonds at 1-800-295-6676.